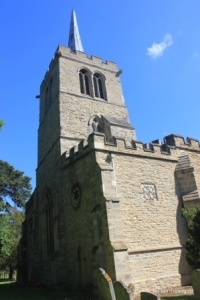 The church of St Mary’s in Wootton is situated to the south west of the village at the junction of Church Road and Hall End Road. 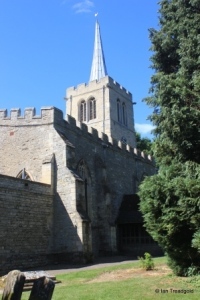 Limited parking is available by the roadside outside the church. 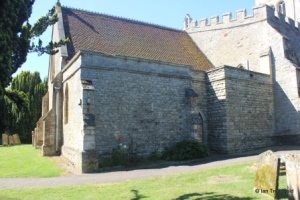 The church consists of a nave and chancel, north and south aisles extended alongside the west tower, a vestry to the north side of the chancel and north and south porches. 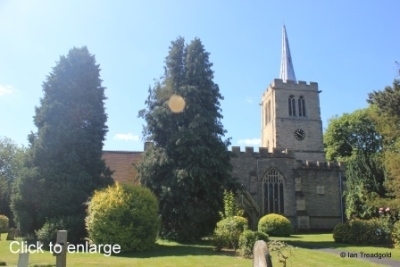 The chancel is around 35 feet by some 18 feet with the nave adding a further 47 feet in a width of around 21 feet. The aisles add around 10 feet each and the tower is some 14 feet square and around 63 feet in height to the battlements with the spire adding a further 25 feet or so. 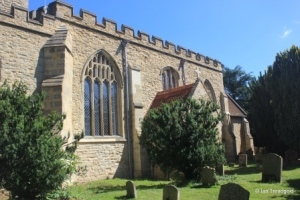 There is evidence of an earlier church on the site dating from C12 but the present building has its origin in the early C14 with the additional works from the early C15 to the south porch and upper part of the tower. The main restorations to the building took place in the middle to late C19 along with extensions to the aisle to form the west end. 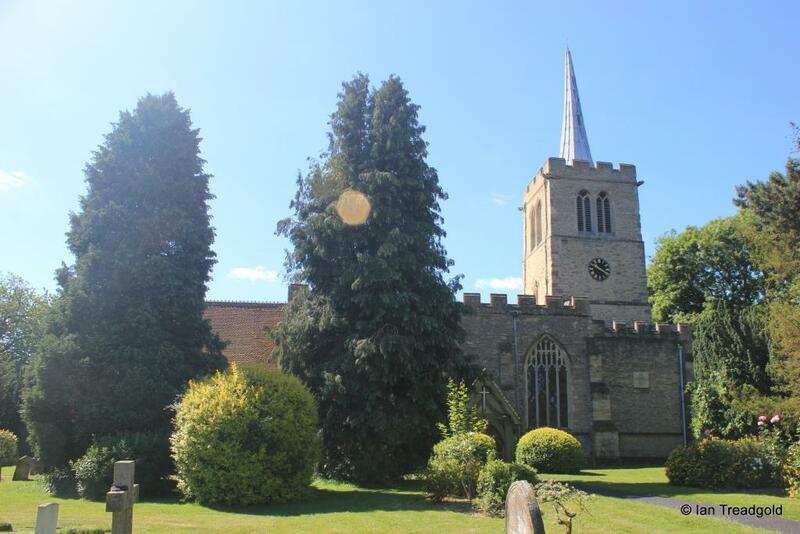 There were further works to the vestry, west end and re-leading of the steeple all in C20. 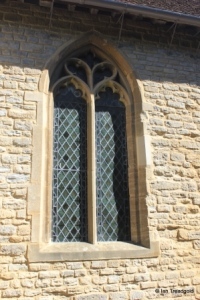 The south side of the chancel has two modern windows to the east and west of the priest’s door along with a small low-level blocked window. 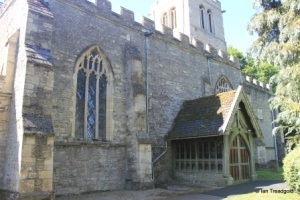 The south aisle has windows to the east and west with large windows on either side of the south porch along with a smaller window high over the roof of the porch. 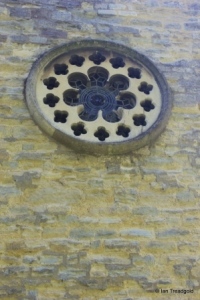 The east window of the south aisle is modern and of three cinquefoiled lights with circular quatrefoil and cinquefoil designs in the tracery under a two-centred arch. 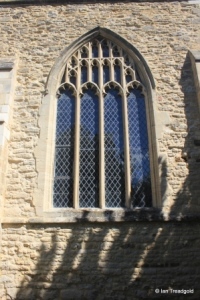 The eastern and western windows of the aisle are the same with four cinquefoiled lights with perpendicular tracery over under two-centred arches. 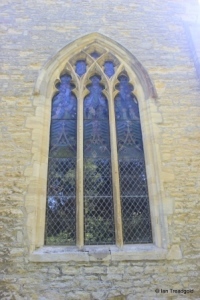 Both are restored windows of C15 origin. 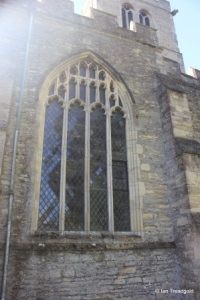 The south porch has a two-light window under a square head to the east and a single small window to the west. 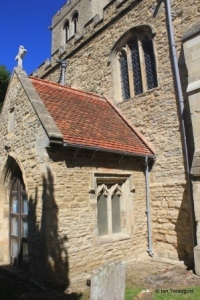 Over the porch roof is an unusual window due to its location. 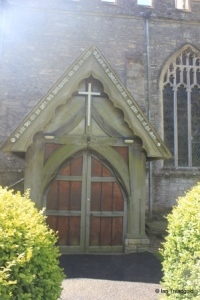 It is of three cinquefoiled lights under a three centred arch. 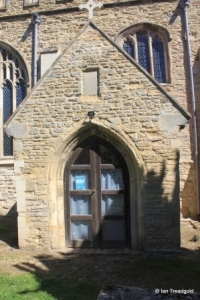 Over the outer doorway is a blocked statue niche. 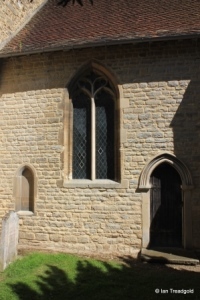 To the western end of the aisle is a restored ornate carving high in the wall where another window might be expected. 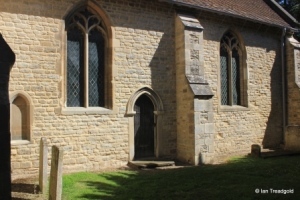 Adjoining this carving is a diagonal buttress marking the original end of the aisle before its extension in C19. 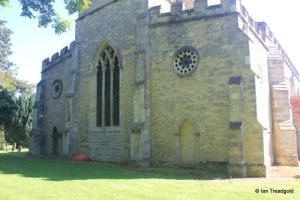 The west end of the church now consists of the extended aisles and the west tower. The ends of the two aisles are effectively the same with incongruous high round windows and narrow doorways below with the southern being blocked. 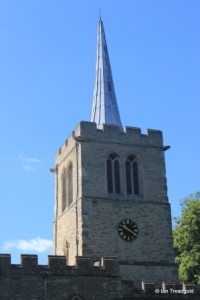 The tower itself is of three stages with an embattled parapet leading to an octagonal leaded steeple above. 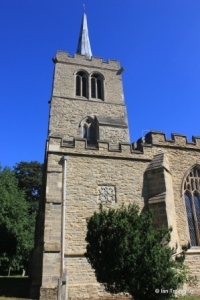 The belfry openings are pairs of conjoined two-light openings and there is a clock face to the north with a stair rising above the south aisle in the south-east corner of the lower levels of the tower. 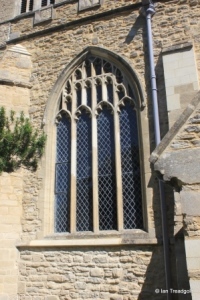 The modern west window is of three elongated cinquefoiled lights with tracery above under a two-centred arch. 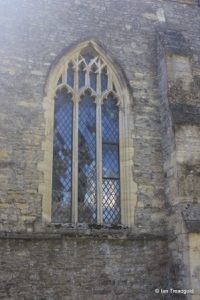 The north aisle has a similar layout of windows to that on the south with windows either side of the porch. 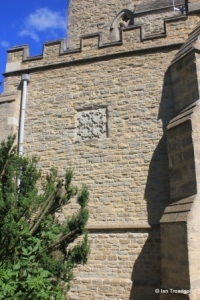 The western extension of the aisle on the north side also has a carving high on the wall. 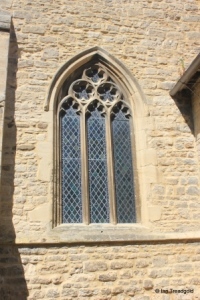 The western window in the north aisle is of a similar style to those in the south aisle. 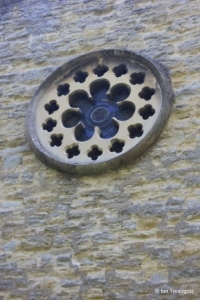 The eastern window in the north aisle is similar but is of three lights rather than four. 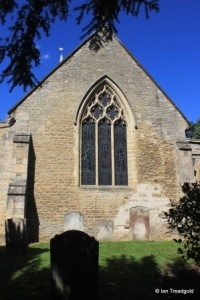 The east window of the north aisle is now partially hidden by the modern vestry buildings. 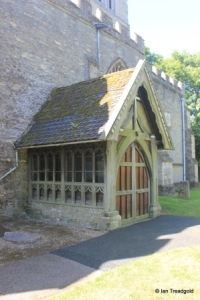 The modern north porch is wooden and carries the inscription “Go your way into his gates with thanksgiving, and into his courts with praise: be thankful unto him, and speak good of his name” taken from Psalm 100. 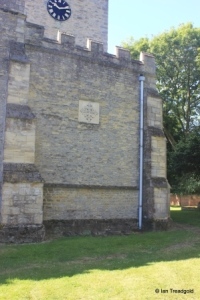 The north side of the chancel is now hidden by the vestry buildings. 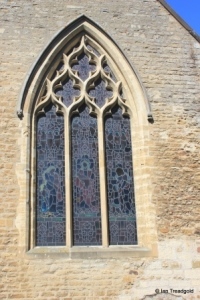 The restored east window dates from the early C14 and is of three trefoiled lights with quatrefoil designs in the tracery under a pointed arch. 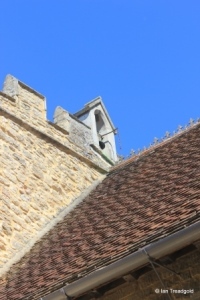 There is a sanctus bell over the chancel arch.